New pavement or asphalt in a parking lot, garage or ramp calls for uniform, long-lasting pavement markings and signs. For existing spaces, heavy traffic, salt, sand, and water contribute to the break down and fading of parking lot striping already in place. Twin City Sweeping is skilled in the application of accurate pavement marking for a variety of spaces, utilizing the highest quality, long-lasting paint from Diamond Vogel. In addition to pavement marking and line striping, we can sweep and pressure wash commercial surfaces, as well as deep clean and provide maintenance for permeable pavers, saving you the hassle of coordinating with multiple vendors. Most importantly, we never sub out our work to contractors. When you call Twin City Sweeping, you get Twin City Sweeping. Maximizing parking spaces with precision line striping allows you to accommodate more drivers. 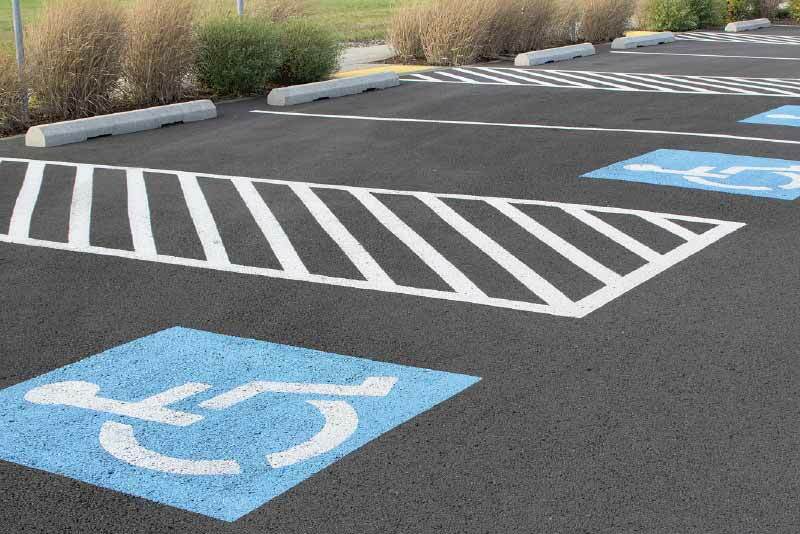 Accurate and durable markings for space numbering, no parking, reserved or handicap stalls ensures you are in compliance with fire and building codes. Twin City Sweeping gets the job done right. Warehouses and loading docks require appropriate markings and signs to guarantee safety and comply with regulations. Twin City Sweeping has the capability and equipment to apply accurate and durable markings in your warehouse. Using the correct equipment for the job means superior results. That’s why Twin City Sweeping only utilizes the highest quality equipment in the industry. For pavement marking and line striping we only use top-quality machinery. Offering precision and high quality results, Twin City Sweeping uses pavement marking/line striping equipment manufactured locally by Graco®, a company located in Rogers, Minnesota. Contact Twin City Sweeping today for a free estimate or to schedule pavement marking/line striping for your space. Call on us for exceptional uniform striping, symbols, and signs created with the highest-quality, long-lasting, heavy-duty paint from Diamond Vogel Inc.